A new version of OS X, called El Capitan, will be coming for free to every Mac new enough to support it. The public beta opens up in July, and El Capitan will arrive in its final version in the fall. This new Mac system will bring us so many exciting features, but for Blu-ray fans and 3D lovers, there is an urgent demand that has yet disclosed – “Directly Copy 3D Blu-ray on Mac OS X El Capitan”. Why we need to Directly Copy 3D Blu-ray on Mac OS X El Capitan? As we know, Blu-ray Discs (including 3D Blu-rays) are easy to break due to frequent insert-and-eject in disc drive. To keep your 3D Blu-ray discs safe, most new El Capitan users are in need of a perfect 3D Blu-ray backup solution on 10.11 El Capitan with professional Mac 3D Blu-ray Backup tool. In addition, there are two ways to backup and copy 3D Blu-ray movie from the original Blu-ray disc, 1:1 backing up 3D Blu-ray to a folder, and copying 3D Blu-ray movie to a file with only the main movie title. Ane it is wise to choice the later one – 3D Blu-ray main title copy since it helps you get rid of all the unwanted titles in 3D Blu-ray and saves a lot of hard disc storage. Let’s take the 3D Blu-ray Beauty and Beast for instance, the full disc copy containing all titles takes up 40GB, while the main title file only takes up 23462MB. That’s the difference! On the one hand, actually, it’s quite different to directly copy 3D Blu-ray movies from that of 2D Blu-ray movie main movie backup. Many people may found they couldn’t backup 3D Blu-ray movies, while some others found that the final copied 3D Blu-ray movies had no 3D effect, only in 2D. On the other hand, many Mac users found that after upgraded to 10.11 El Capitan, they will run into the problem that the Mac Blu-ray Copy software cannot running or APP cannot open on El Capitan due to the system compatibility. 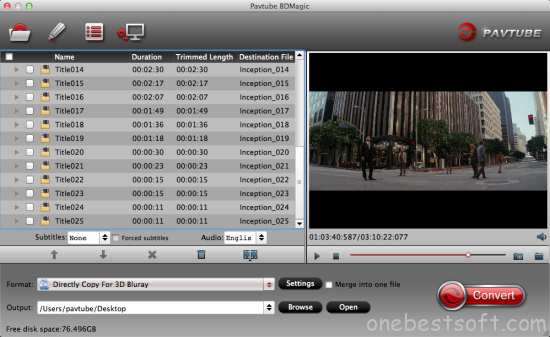 * Pavtube 3D Blu-ray Copy for Mac- BDMagic for Mac installed on Mac. With it, you can copy the main movie only from a 3D Blu-ray with original 3D effect on Mac OS X El Capitan and leave out unwanted menus or other extras. Except backing up 3D Blu-ray movies on your hard drive, you can also use it to rip and convert 3D Blu-ray movies to any 2D/3D format you want or any tablet, smartphone or HD media players, 3D players with optimized video formats. If you wanna make a full disc copy on Mac, please turn to how to backup a Blu-ray with original structures. Now free download Pavtube BDMagic for Mac and install it on your computer. Then check the below guide to learn how to make 3D Blu-ray main movie backup on Mac OS X El Capitan without quality loss. 1. Import 3D Blu-ray source. 2. Choose the copy mode. Finally, click “Convert” button to start lossless 3D Blu-ray Backup for Main Movie on Mac OS X El Capitan. When the copying work is done, you are able to click “Open” button to get the output .m2ts files without any other extra contents. 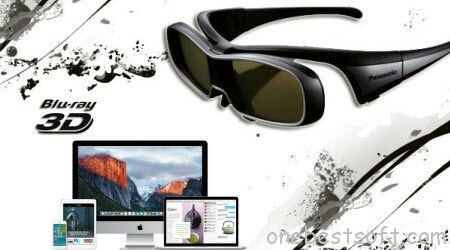 With the best 3D Blu-ray Backup and copying tool for Mac OS X El Capitan, you can keep your 3D Blu-ray discs from scratching, manage movies in a more convenient way and watch 3D movies freely at home instead of going to cinema. Just try it now! Note: For Windows users, Pavtube BDMagic offers effective 3D Blu-ray main movie backup solution without quality loss. Another two programs can also do the job like ByteCopy and Video Converter Ultimate, and read the comparison review.